This is the last of a series of features about the events, activities and personalities that make up BCMFest 2015, which begins this Friday (January 9). Even as it celebrates the Celtic music traditions that have been around for centuries, BCMFest also looks ahead to the future, by supporting and encouraging the coming generations of musicians, singers and dancers that will carry on these traditions. 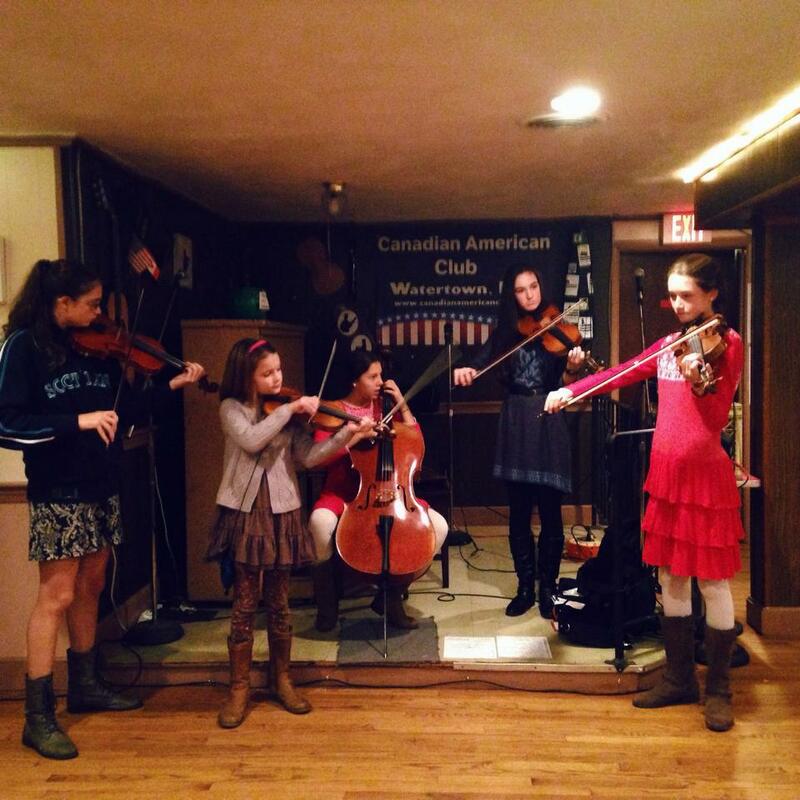 Among their ranks are the members of Scottish Fish, a middle school/high school-age fiddles-and-cello quintet that performed at BCMFest 2014 and has brought their enthusiasm for Scottish and Cape Breton music to sessions, concerts and other events around the Boston area. Ava, Caroline, Guilia, Julia and Maggie recently took time off from their preparations for BCMFest 2015 to talk a little about their life and times as Scottish Fish. Hooked on Celtic music: Scottish Fish, shown here performing at the Canadian American Club in Watertown. Q: OK, so what’s the story behind your band name? SF: We were at a fiddle camp in 2011. One of us found Swedish Fish candy under a bed that were hidden there by a roommate and announced that they were “Scottish Fish.” Later that night, we used the name for a band performance. Q: And have any of you ever actually seen or eaten Scottish fish? SF: Some of us have had smoked Scottish salmon for Christmas Eve dinner. For the rest of us, the answer would be “maybe?” or a shrug. Q: When and how did you start playing together? Did you all know each other before then? SF: Two of us met at Green Mountain Suzuki camp in Vermont, some of us go to church together, and another two of us met in nursery school. We all ended up at camp together at Boston Harbor Scottish Fiddle School in 2013. Q: Did you immediately think to yourselves, “Oh wow, we’re a band!” or was that something that just happened over time without you being aware of it? SF: A few of us played together at various times and at camps between 2009-2012, and by August 2013 we had become the band we are now and started playing gigs that fall. Q: Who are some of your favorite Celtic musicians? SF: Hanneke Cassel!!! Katie McNally. Natalie MacMaster. Adam Sutherland (we named him “Shrub” at Boston Harbor). Q: Families these days usually a lot going on, what with school, work, other activities, etc. Are you able to get together pretty regularly to practice and/or jam? What’s that like? SF: It’s kind of crazy. We get together when we can, and at various times we have had regularly scheduled sessions together (Thanks Katie!). We have also had a few vacations away together in Maine and New Hampshire – lots of fiddling, swimming, “working out” and other fun. Q: What do you like the most about playing Celtic music? SF: Everything! Learning by ear, writing your own stuff, playing your own arrangements, and making the music your own, unlike other music where you are supposed to only play it as it was written.